Grace and peace to you from God our creator and our Lord Jesus who is the Christ! Will y'all pray with me? Let the words of my mouth and the meditations of all our hearts be acceptable in your sight O Lord, our rock and our redeemer. Amen! Good morning and welcome to this the Epiphany of our Lord. This is the day we celebrate the wise men or magi from far off follow a star and come to pay homage, respect, and worship the one who was born as messiah and King of the Jews. They came to worship the one who they discerned from gazing into the night sky, following a star to the little town of Bethlehem within the tiny state of Benjamin. Let’s look at these wise men and see what God is teaching us through them, and what we can learn even still today. If you hadn't figured it out yet, these aren't Jewish men. We don't even know how many of them there are (for scripture doesn’t tell us – no matter how many stories we hear and song we sing that depict three). However, there are a few things we do know about them. There are more than one. They are 'wise' or as some translations call them 'magi.' Though, we have wondrous hymns (one of my favorites) talking of "We Three Kings" - they aren't really described as kings in any way. Even though they aren't described as 'kings' within the text, we do know that they were incredibly wealthy, or at the very least represent incredibly wealthy places. The gifts they offered Jesus are extravagant. They would’ve been extravagant for anyone born of royalty, let alone someone born to a poor carpenter and his wife. Each of these gifts were rare, traded frequently, and lustfully sought. Myrrh was known at times to be EQUAL in its weight to that of gold. There were times when myrrh was even more rare it surpassed that high value. These were not run-of-the-mill ever day gifts. They didn’t stop at the local Dollar Store or Wal-Mart as they entered town to get a quick gift. They were gifts befit of someone truly grand. Hopefully you noticed that these gifts were not given to the only person who is named a ‘king’ in this reading. These extravagant gifts were not given to King Herod. These wise men were also, well... very intelligent. You might even call them 'scientists' of their day. They used their gifts of searching through the night sky to see signs of anything. Through their own skills and rituals, they were witness to something different - a star different from the others - and the light of this star led them to the City of David to see the 'King of the Jews' born under that star. 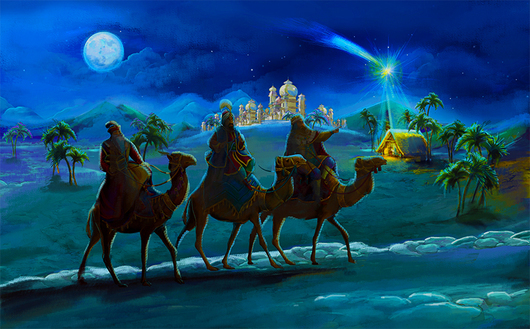 So, it was these men, offering lavish gifts, following a star in the night, from distant lands, who came to Jerusalem to tell King Herod and all the scribes that their messiah had been born. That is something you’d would think the scribes would already know being that they were 'in the know' within their own faith life. They studied scripture in order to ‘figure’ out what God is up to in the world. Yet, that's not how God is typically made known in the world. God usually shows up in places and through means we least expect. The story of Jesus birth is full of these different ways. This treasured story about how God was born into the world as a child within a poor family, wrapped in cloth, resting in a feeding trough. His first visitors were not people of 'stature,' but instead dirty shepherds grazing their sheep in the field during the middle of the night. This morning we continue that thread line where God's light - shown through a star in the sky - calls and leads men from the east (some scholars say Persia, but no one really knows) on a trek to pay homage and worship this young king of kings. It is through these men - outside the realm of Judaism - who tell the political and religious authorities of God's own people that God was among them as messiah. When you take a step back and really think about it, it is all sorts of ridiculous. This isn’t how we’d tell the story of this momentous moment. So, what does this mean for us today in the 21st century? I think if we really look at this text we can be a little surprised that God worked through the gifts and rituals of another faith to reach out and embrace all people under Christ the king of kings. Did you ever think about that? Remember, these men from far off are not Jewish. We can assume that they are of a different faith altogether. Yet, they come to worship the one born in Bethlehem. I truly find it comforting that God does work in this way. Yet, in a way it is also somewhat frightening too. I stand here and preach the gospel hoping and praying that people hear my words, see God working through this community of faith, and come to the one who accepts all under the cross out of love, forgiveness, and mercy. Yet, we see in this beautiful story that it isn't words, liturgy, or sacrament that lead these men to the Christ child. Instead they come to 'see Jesus' and God's action in their lives through other means. In this story it is through their collective gifts of discerning the movement of the stars. I've shared this story before, but I think it is worth mentioning again. When I was in seminary, I was blessed with an opportunity to travel to Mexico for about 3 weeks. Living, eating, studying, and fellowshipping with those of a context completely foreign to my own. We learned of the life that these people lived - the poor, desolate life that many live through day in and day out in Mexico City (and elsewhere). We were able to see holy sites that were both Christian, native, and an interesting mix of both. We were also able to learn and study under profound descendants of the native and ancient Aztecs. As we studied and learned, one individual told us of a wonderful story of his people's life. When the "Christians" came and sought to 'save' these different people and bring them to Christ, they read and taught them the Bible and all its wonderful stories of God's action within the life and history of the world. But, one of the more outspoken and faith-filled 'converts' came to those chief priests and stated, "Father, I want you to know that you did not bring us God. For the entirety of the history of my people, we have always worshipped God. We have seen and felt God's action in our lives as we farmed, as we loved, as we built, as we looked at the world around us. No, you haven't 'brought' or 'given' us God. What you have given us, is God's name - Jesus. Thank-you for that." I loved that story, and even years after hearing it, it still sticks with me. Especially in light of this Day of Epiphany and throughout the season of Epiphany. Where a light came to those far outside the realm and supposed 'reach' of God's people and led them to this child, this King of Kings. Where upon seeing this child - well after his birth - fell down in exceedingly great joy and worshipped him. Showering him with gifts of riches - greater than that given to 'kings' of their day. Gifts not even given to the ‘actual king’ in this story. God reaches out to each of us, God calls each of us - those of us sitting in these pews this morning and even those not currently with us - and draws us all to this one born as messiah. For, God announced the birth of the messiah to shepherds through an angel on Christmas, to wise men via a star on epiphany, and to the political and religious authorities of God's own chosen people through foreign visitors. From a manger, where a child lies wrapped in bands of cloth, God's reach, God's embrace in Christ Jesus gets bigger and bigger and bigger. Jesus eats with outcasts and sinners. Jesus touches people who are sick and people who live with disabilities. Jesus even calls the dead back to life. Ultimately Jesus draws all people to himself as he is lifted upon the cross. In Christ Jesus, no one is beyond God's grace. God calls all of us to Christ. God uses means and ways that we couldn't possibly imagine leading us to Christ. God uses ways that many of us would consider non-traditional and possibly even weird. Yet, God's desire to embrace all people and God's own work to share the gospel is far greater than our collective understanding. It is more 'mystery' than formula. Where is God shedding the light of Epiphany within our own lives? Possibly, even using YOU in ways that you couldn't imagine to bring the light of Christ into others' lives? Perhaps even using others to share God’s light with you in ways you wouldn’t expect. Use the gifts you have been blessed with - the gifts of music, teaching, driving, collecting, caring, even staring at the wonder of the stars - to see God's action in your life. See that God is at work through you and in all the wonders that make you – you. Use your gifts to shower and point and proclaim God's work in Christ Jesus - the king of Kings, the LIGHT of Epiphany that shines on all and leads all of us to the Cross of Christ.